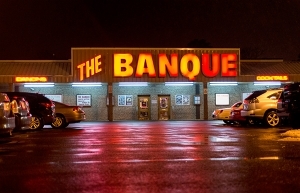 The Banque is an Award Winning Country Western Restaurant and Night Club that continues to serve fun-loving crowds since its opening in 1973. Join us for free dance lessons Wednesday, Thursday and Friday nights. The kitchen is open at 6pm Wednesday through Saturday. The Banque is the place to meet and the place to eat! Perfect for after work parties, birthday parties, and get-togethers of all kinds! Reservations are recommended. Call for special party options. We are the party professionals. Eatin’, Dancin,’ & Havin’ Fun!! Meet our Chef, Ms. Sarah! The wonderful mind behind all our prime rib, chicken wings, meatloaf, and more. Including our new menu! Ms. Sarah loads her dishes with more excitement than you will find in other restaurants. She was born in Laos and came to the US at 5 years old. She has lived and cooked all over since then! You got me with the picture of the LIVE LOBSTER! We are currently considering Smarthmouth, Young Veterans, O'Connor, Pleasurehouse, Commonwealth, Bold Mariner, and more! All good choices! Any craft beer addition is in the right step. Wasserhund is my favorite local.